Last night we had Chicken Pot Pie and roasted potatoes, but today Brock was able to make it home so we ordered in pizza, and I spent my cooking time making pie. It was about time that I tried an all butter crust again, so I decided that this easy one from ‘Baked – New Frontiers in Baking’, by Matt Lewis and Renato Poliafito, was worth a try, and I used the food processor. It was great, especially when used for an Easy Apple Pie though for this pie I allowed the apples to macerate with the sugar and spice for a couple of hours before draining them, then tossed them with a bit of cornstarch and reduced the juice with a bit of butter before adding it back in – the extra time was really very worth it. Measure the flour, sugar and salt in your food processor and pulse a couple of times until combined. Add the butter and pulse in short bursts until the butter is the size of peas. Scrape this mix out into a large bowl – if it’s gotten too warm, put the bowl in the freezer for a bit. Drizzle the water over the mix and use a sturdy spatula to work it all together until a craggy, uneven mass forms, then quickly knead the dough to bring any loose pieces together. If it’s too dry, sprinkle with more water, 1 tablespoon at a time. Flatten each ball into discs, (or, for the Deep Dish Apple pie, flatten it into 1 disk) wrap well in plastic wrap and refrigerate for a couple of hours before using. I put mine into a Ziploc as well and placed it directly into the freezer – but I’ve also made it ahead and kept it in the fridge for a couple of days. And here’s where Deb Perelman describes rolling out the dough the best – dust your counter lightly with flour, sprinkle the top of the dough with flour, and begin rolling. Keep it moving, roll a few times in all directions, flip it over, roll some more, turn it, sprinkle a touch more flour if it sticks anywhere. If it really starts to get away from you, slid it onto a plate and put it back into the fridge for a bit. Don’t fight it, just keep rolling, firm dough rolls more cleanly than soft dough – I found it quite heartening actually, how straight forward it was to get a nice round. 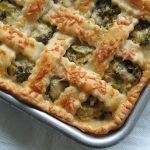 If the dough is for a pie – of any size – fold it gently into uncreased quarters, then carefully lay it into your pie plate so the corner meets the bottom, then unfold and let it naturally drape against the inner sides – trim the overhang as needed and proceed with your pie – try it! Butter is crust is not as intimidating with proper instructions!